Every rose has its thorns. Inside a vaulted church, Sarah Burton explored the complexity of the English rose, with a darkly romantic collection that pushed the familiar to unexpected new heights. Backstage, Burton said the show was about “nature, fragility and beauty”, and indeed, models felt like the women that occupied the pages of Egon Schiele’s sketchbooks – sensual yet removed, undone and ethereal. With dark feathers and floral prints, the designer brought things back to nature – a favourite, almost obsessive playground of McQueen. Just days before the opening of Savage Beauty, his V&A retrospective, it felt like a tribute to the late designer’s ability to always go beyond the surface level, reveal a beautiful hidden darkness. 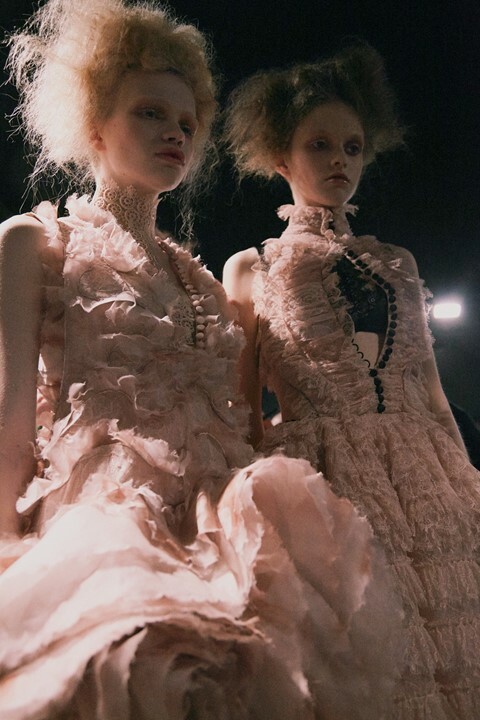 With candyfloss hair, white eyelashes and primly perverse Victoriana collars that transformed models into off-kilter dolls. Gothic leather chokers were cut to look like lace, encircling the throat before extending suggestively down to the breasts. Buttons on both the backs and fronts of dresses were left undone – prim stiff collars devolving into bare flesh as fabric fell apart – while smoothly sensual leather boots ran down the leg and finished with a perspex heel.